Such extreme, hazardous and unpredictable environments present a very difficult challenge to reliably record volcanic behaviour for analytical models. For some volcanoes it is simply too dangerous for a human approach. To tackle this problem researchers from across the Faculties of Science and Engineering have developed highly specialised sensor pods, called "dragon eggs", that can be positioned in dangerous locations using a drone and provide valuable real-time data of volcanic activity that can be used to inform volcanic hazard assessments. The "dragon eggs" currently being developed are autonomous and intelligent sensor pods designed to monitor volcanic activity. They are being equipped with a range of state-of-the-art sensors for temperature, humidity, vibrations, and numerous toxic gases. A significant challenge is optimising the design to meet many different criteria. 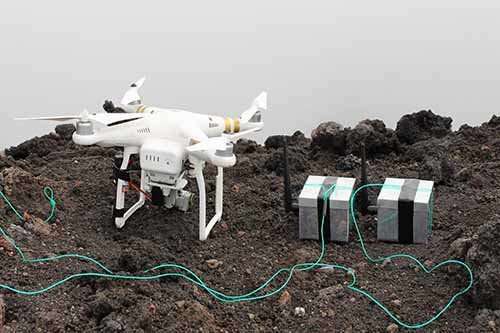 They must, be able to operate in the extreme conditions of a volcano, be light enough to be carried by a drone, and be ultra-efficient in power consumption since maintenance is not an option at the summit of an active volcano! These sensor pods are the result of an intense cross-faculty collaboration and incorporate remarkable new technologies invented and developed at the University of Bristol. Among these, the self-energising event detectors, known as "sensor-driven" detectors, are a vital part of this new device. They allow the eggs to remain dormant for prolonged periods of time, preserving power, until volcanic activity is detected when the dragon egg "hatches" into a full-featured remote monitoring station with a wireless transmitter. Dr. Yannick Verbelen, Research Associate in the School of Physics, said: "It is the first time an autonomous system using zero-power listening technology has been deployed in this kind of hostile environment. We are pushing the limits of the sensor driven low-power monitoring in this application, but that's what research is all about." Dr. Kieran Wood, Senior Research Associate and UAV specialist in Aerospace Engineering, explained: "This is an exemplary application for using UAVs (drones). Approaching volcanoes is hazardous and logistically challenging. UAVs can efficiently place sensors at long-range to minimise risk and improve the efficiency of data collection". Lead at Bristol for both grants, Professor Tom Scott, said: "Combining the cross-disciplinary expertise and technologies from several complimentary grants working together has allowed us to achieve something truly game-changing. Such an approach has enabled us to deliver results on a much shorter timeline and smaller budget than would usually be possible."